With competition hotting up in the internet messenger space, their web versions are seeing a lot of innovation Meebo presents a single unified interface for all popular IM clients including those from Yahoo, AOL, Google and MSN. Once you are on the Meebo website, supply your screen-name and password for various services and link them to your Meebo. Instant messaging is probably the next best thing to happen after email. In fact, some technology pundits even claim that IM technology will have the same effect on email as what the former had on postal snail mail years ago. Almost every major internet heavy-weight including AOL, Yahoo!, Microsoft and Google have their own instant messaging software that are used by millions of users across the globe. Most desktop based IM software-like Yahoo! Messenger, AOL, Google Talk (aka GTalk), Windows Live Messenger (formerly MSN Messenger)-run unobtrusively in your system tray and let you to easily connect with friends (aka buddies) in any corner of the world through text, voice or even video. Because the competition is so hot in the IM space, we have seen lot of innovation in past few months. Google Talk and Yahoo! have released web version of their IM software that require no downloads or installationsimple chat using your web browser. These web-based IM clients are excellent alternatives especially when you are browsing in an internet cafÃ© where the desktop software is not installed on the local machine. You will however miss certain useful features like voice chat, streaming music or sharing files. (Don’t tell this tricks to your boss: If GTalk or Yahoo Messenger is banned in your organisation, you can still chat with friends located outside the corporate firewall with the help of these web clients.) With so many IM clients available today, consumers get more choices but this also brings a major problem-what do you do in a situation when some of your internet friends use GTalk, some prefer Yahoo! Messenger while the rest of them are on MSN? One option is to have all these clients running simultaneously on your system in the background but that will put a significant load on your CPU especially when you’re using an old computer or one with not enough RAM. Option is therefore ruled out. 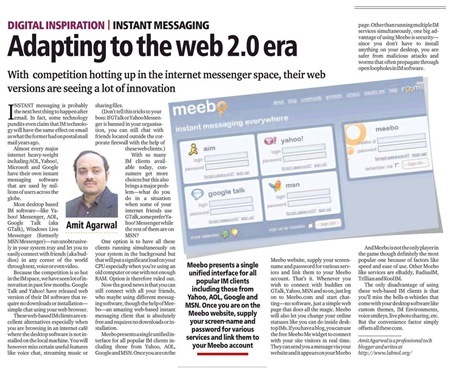 Now the good news is that you can still connect with all your friends, who maybe using different messaging software, though the help of Meebo-an amazing web-based instant messaging client that is absolutely free and requires no downloads or installation. Meebo presents a single unified interface for all popular IM clients including those from Yahoo, AOL, Google and MSN. Once you are on the Meebo website, supply your screenname and password for various services and link them to your Meebo account. That’s it. Whenever you wish to connect with buddies on GTalk, Yahoo, MSN and so on, just log on to Meebo.com and start chatting-no software, just a simple web page that does all the magic. Meebo will also let you change your online statuses like you can do inside desktop IMs. If you have a blog, you can use the free Meebo Me widget to connect with your site visitors in real time. They can send you a message via your website and it appears on your Meebo page. Other than running multiple IM services simultaneously, one big advantage of using Meebo is securitysince you don’t have to install anything on your desktop, you are safer from malicious attacks and worms that often propagate through open loopholes in IM software. And Meebo is not the only player in the game though definitely the most popular one because of factors like speed and ease of use. Other Meebo like services are eBuddy, RadiusIM, Trillian and Kool IM. The only disadvantage of using these web-based IM clients is that you’ll miss the bells-n-whistles that come with your desktop software like custom themes, IM Environments, voice smileys, live photo sharing, etc. But the convenience factor simply offsets all these cons.